Verizon has applied for the City of Sebastopol’s approval to install two new cell tower transmitters; one at 965 McFarland Lane and another at 6985 Hutchins Avenue. A third cell tower is proposed at an unspecified location just outside city limits and would presumably need county approval. Verizon claims this project will improve public safety because it will ensure that the public can continue to make emergency telephone calls. This capacity already exists now throughout all of Sebastopol, without adding new cellphone towers. They also claim that these cellphone tower sites will provide backup to existing landlines during natural disasters. This claim is also false. Seventy-seven cell towers burned to the ground during the recent wildfires. Underground copper lines did not. During an earthquake the power loss to the ventilators of cellphone tower power packs would also fail rendering them useless. Every cellphone application comes with the claim that the resulting increase radiation is safe since it is well below the levels established by the FCC. To date, no FCC long-term exposure studies have been completed. The radiation emitted by cellphone towers has been scientifically proven by overwhelming evidence of hundreds of peer-reviewed scientific articles to cause cancer and other adverse health impacts. This conclusion was reinforced by a $25 million National Institutes of Health (NIH) study released in May 27, 2016 showing that cellular radiation causes the deadly brain cancer: glioblastoma. The International Association of Firefighters (IAFF) opposed small cell towers near fire stations due to the health effects of cellphone microwave exposure, which included headaches, memory loss, ringing in the ears and brain scan anomalies. Now, Assembly Bill 57 states that small cell towers can no longer be located near a fire station. Would you like a small cell tower near your home or workplace? Fortunately Governor Brown vetoed Senate Bill 649, which would have eliminated local government’s ability to regulate cellphone tower operations. Consequently the Telecommunications Act of 1996 applies, which means that local governments are required to approve cell phone towers when there exists lack of coverage, but not when there is a lack of bandwidth (capacity). 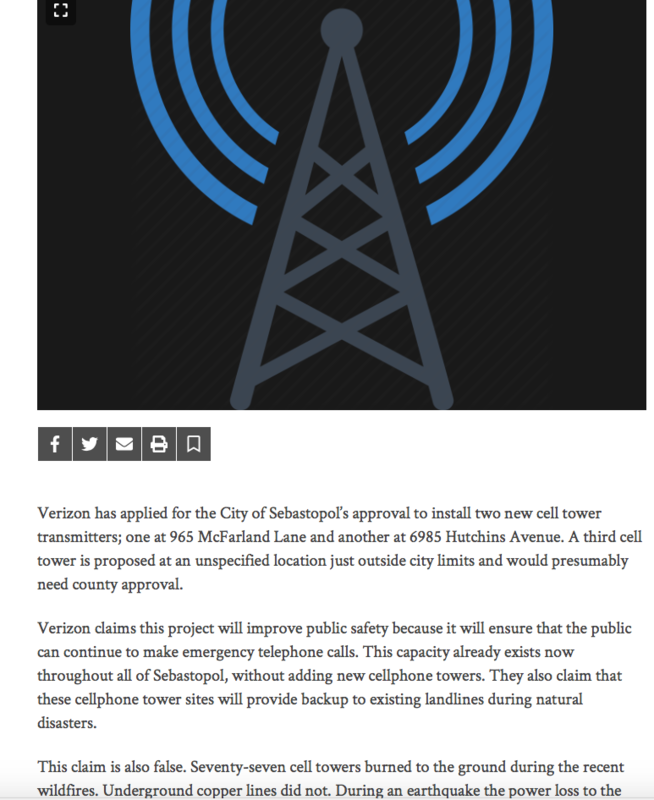 Verizon’s application to the City of Sebastopol to provide 4G and subsequent 5G services did not include documented evidence of a “significant lack of coverage.” Verizon’s cellphone tower proposals are intended only to increase the capacity of their network beyond their current capacity. There is also the danger of transferring potential liability for cell phone towers from telecommunications industry to local governments. It is a matter of well-established public record that the international re-insurance industry has long refused to insure any aspect of the telecom industry for injuries caused by cellular devices or installations. Would Sebastopol open itself up to legal issues by granting approval of Verizon’s application – which would allow for future additional cell phone towers and co-location of additional small cell transmitters scheduled for their 5G rollout? And what should be done about the fact that the 2005 Appraisal Journal article found that properties near cellphone towers suffer a devaluation of 20 to 25 percent due to fears of radiation and aesthetics? We should urge the city council to adopt a temporary moratorium on additional cellphone towers until Sebastopol’s antiquated Telecom Ordinance can be revised to take into account the extent to which local governments can regulate cellphone tower operation and location. This would reflect the community’s growing concern with the adverse and significant environmental, health and property values impacts of 4G and 5G telecommunications facilities that are evolving faster than our ability to develop an appropriate regulatory framework. This action is defensible and has precedents. Other California local governments have adopted temporary moratoria on cell tower approvals including Fresno County, Burlingame and Hillsborough. Write, phone and email our city council and planning commissioners and tell them to delay approval of Verizon’s application and adopt a temporary moratorium to allow the community, city staff and council to make an informed decision about how to deal with this new technology. Paul-André Schabracq is a planning and environmental consultant who keeps his cellphone off unless he needs it.